Twenty-seven-year-old doctor Abdullahi Mohamed came to America in 2013 to build a better, safer life. Raised in Somalia, he grew up in a family that placed a high value on education. When he graduated from high school, Abdullahi was at the top of his class and the envy of his peers. In the early 2000s, as the war in Somalia was getting worse, Abdullahi felt threatened by the jihadist militant group al-Shabaab, which was targeting educated individuals and families of minority groups in his area. 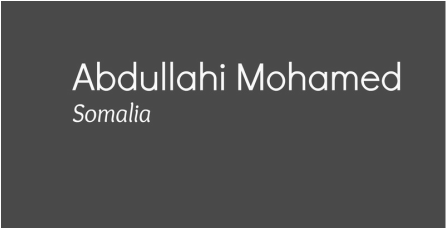 When life in Somalia became too dangerous, Abdullahi headed to Jordan, where he lived from 2004 to 2013. His mother told him not to return to Somalia because al-Shabaab would target him once he was trained as a doctor. She urged him to find a better life elsewhere so he could be happy and send support to those he left behind. When Abdullahi graduated from medical school in 2011, he couldn’t get a permit to work in Jordan legally. He couldn’t return to Somalia either because it was unsafe. That same year, he registered with the Office of the United Nations High Commissioner for Refugees (UNHCR). Because Abdullahi was educated and could speak some English, Somali and Arabic, he was able to navigate the difficult refugee registration system fairly easily.